July 2, 2015 – Carrying more than 6,100 pounds of food, fuel, and supplies for the International Space Station crew, the unpiloted ISS Progress 60 cargo craft launched at 10:55 p.m. MDT (10:55 p.m. local time in Baikonur) from the Baikonur Cosmodrome in Kazakhstan. 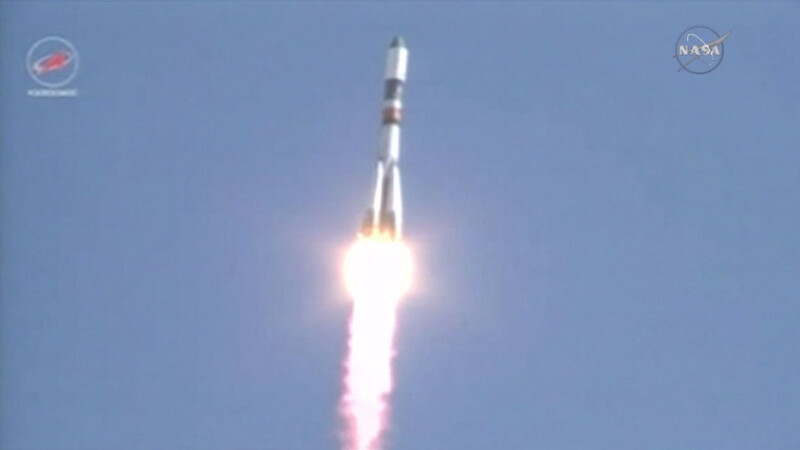 Less than 10 minutes after launch, the resupply ship reached preliminary orbit and deployed its solar arrays and navigational antennas as planned. The Russian cargo craft will make 34 orbits of Earth during the next two days before docking to the orbiting laboratory at 1:13 a.m. MDT Sunday, July 5. On June 28, SpaceX CRS-7 suffered a critical failure and exploded about 1 minute after launch with complete loss of the vehicle. The SpaceX Cargo Dragon was carrying more than 4,000 pounds of supplies and payload. It was delivering the first of two international docking adapters that will allow future commercial crew spacecraft, including the SpaceX Crew Dragon, to dock with the ISS. NASA said that it would work to replace these items on future cargo flights and that there was no immediate impact to station operations. However, after a string of mishaps that includes a Progress failure in April and the Orbital Antares failure last year, it will be a relief when Progress docks with the space station on Sunday.